Every equine athlete that shines on the racetrack is the product of careful breeding and the efforts of countless people who have contributed to the process throughout the years. 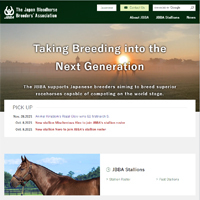 The Japan Bloodhorse Breeders' Association supports the Japanese breeding industry in continuing this tradition. The JBBA is comprised of breeders of racehorses throughout Japan. As an association, it is involved in various aspects of breeding, pre-training and market distribution of racehorses, and its activities include providing data to breeders, promoting interaction between different breeding areas in Japan and also developing positive relationships with other racing countries. The goal of the JBBA is to contribute to the improvement of the Japanese bloodstock industry by supporting breeders in their efforts to produce superior racehorses.